Julie here. 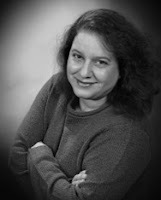 Today, we're delighted to have Marilyn Brant as our guest at What Women Write. I met Marilyn in October in Portland at a writer's retreat, and was instantly drawn to her warmth and sense of humor and spent lots of time chatting with her--and even ended up sharing one segment of our return flights. She sent me home with an advance review copy of A Summer in Europe. I was delighted to have a chance to read it before it released in early December and thrilled when she agreed to be our guest here on What Women Write. Brant’s newest…distinguishes itself with a charismatic leading man and very funny supporting cast, especially the wonderful elderly characters with their resonant message about living life to the fullest. Brant’s charming and engaging tale will allow readers to immerse themselves in the magic and beauty of Europe along with the characters. Although the descriptions of the scenery are amazing, the development of the characters and their unique personalities are what really make this novel shine. What an enjoyable escape! Marilyn, welcome! I think you'll be pleased to hear that my mother got her hands on my copy of A Summer in Europe last weekend, and polished it off in about 24 hours. You got the "Julie's Mom's Stamp of Approval." She visited many of the destinations in your novel many years ago with a friend and raved about how much fun it was to revisit them in your story! Many thanks to Julie for inviting me to visit What Women Write. I'm so delighted to be here today! 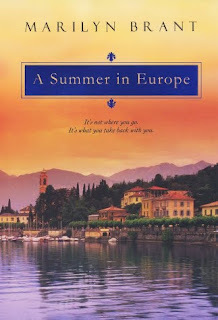 After about twelve blog stops so far, some of you may already know that I’ve been celebrating the release of my third women's fiction book, A Summer in Europe, by taking a journey around the Web and talking about some of my favorite European sites—ones that specifically appear in the new novel. I’d hoped to share a few personal memories of places I loved and some of the ways in which these fascinating cities inspired elements in the book. This story is about a woman named Gwendolyn Reese, who’s bright intellectually, but hasn’t experienced much of life despite having just turned thirty. That’s about to change when she gets a month-long tour through Europe as a birthday gift from her eccentric Aunt Bea…and her aunt's Sudoku-and-Mahjongg Club. They all fly from Dubuque, Iowa, to Rome, tour through Italy, Southern France, Switzerland, Hungary and then cross the border into Austria on their way up to Paris, Brussels and London. By the time they’ve reached Vienna, Gwen’s been on the tour long enough to have gotten to know quite a few of her travel mates. In some cases, her first impressions were not quite accurate. In others, well, it turns out she was right to be on her guard! European tour is a whole lot like the middle segment of drafting a novel. You have a solid start and a general sense of direction. You’re getting into the swing of things and know the people/characters you’re dealing with fairly well, but there are still a lot of unanswered questions. Still waaayyyy too many loose ends to even think of winding down such a massive undertaking. So many miles remain, and the only way to get from where you are now to where you’re headed is through … whether it’s writing scene-by-scene for a book or traveling city-to-city for a tour. 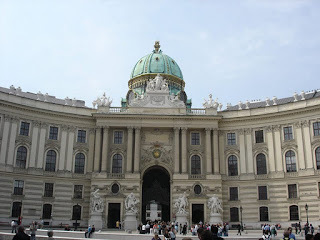 For me, the very real Vienna has been a midpoint on two different backpacking journeys. I was always aware when I arrived just how far I’d already traveled and, likewise, how far I had yet to go. Since I write chronologically and go through a similar experience when working on a novel, I found myself quite literally structuring the story trip the way I might have structured a real one: The stages of travel and the stages of my writing about it were mirrored at nearly every step. It was almost more metacognition than I could handle sometimes! LOL. 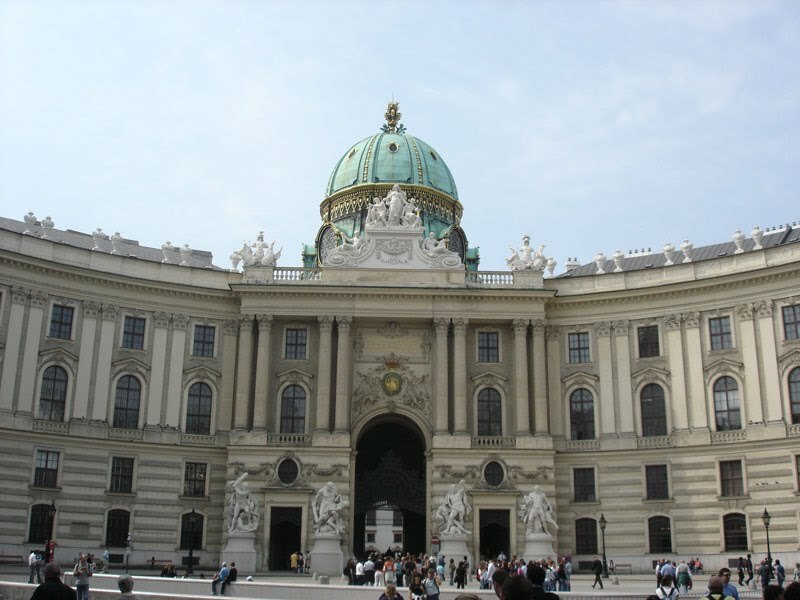 Like Budapest, Hungary, Vienna is a city on the edge of eastern and western Europe. I found myself constantly reminded of that, especially in the architectural design and the colors of some of the buildings. The roof of the Hofburg Palace (once the Imperial Residence of the Habsburgs and now the official home of Austria’s president), for instance, is particularly striking to me. I tried to explain in the book things like the vastness of the city—a capital packed with museums, famous buildings and gardens. My characters got to visit a number of places I once went to, like Schloss Schönbrunn, Beethoven’s grave in the Central Cemetery, St. Stephen’s Cathedral and the major park, the Prater. 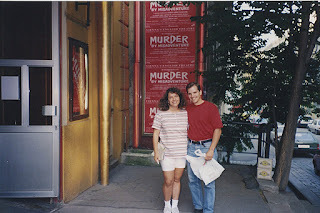 And, because my heroine Gwen has great affection for music (she privately wishes she would have learned to play the violin better), I couldn’t ignore the obvious: Music is like a heartbeat in Vienna. It’s simply a part of life there, with music students practicing on the pedestrian walkways and various professional shows at theaters all over the city. I was often struck by how much respect the Viennese have for musicianship in general, and how well even the kids on the sidewalks could play their instruments. But even aptitude wasn’t always a requirement. I play a little piano (very little, incidentally, and rarely well) but, after hearing so much music in town, I couldn’t keep myself from fooling around with the black grand piano sitting in a room off to the side of our hotel’s lobby. The place was deserted—just the one guy behind the desk in the other room, and it was mid-afternoon so most guests were out sightseeing. But within sixty seconds of me starting to play some pseudo-classical tune I was making up on the spot, an older woman sat down in the corner to listen to me (seriously?!) and the desk clerk left his post (why?!) and stood against the wall watching me and contemplating—I soon found out—what composer I was attempting to play. “Mahler?” he asked, confused but very politely. “Who wrote that?” Ha! My piano playing skills don’t warrant this kind of attention AT ALL, trust me, but the attitude of the city had seeped in. And it wasn’t about me or even about musicians, it was about a love of the music itself. I’m no longer surprised that Billy Joel chose Vienna as the setting of a song—one of my favorites from The Stranger album. I’ve read some of what he’s written about it and his inspiration for it—definitely it’s a city at the crossroads. And I think of his lyrics often when I’m in the midst of writing a book because they address the need some of us have to get more done and to be further along with projects or with personal growth than we are. At one point he sings: “Slow down, you’re doing fine. You can’t be everything you wanna be before your time, although it’s so romantic on the borderline tonight…tonight…” If I could have advised my heroine on anything, it would have been to follow Billy’s wise words. 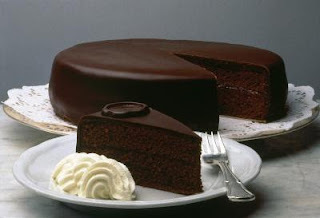 Finally, I would be remiss to rave about Vienna and not mention a delicious desert we had there called Sachertorte, which made a strong enough impression on me that I had to include it in the story. It’s a rich chocolate cake with apricot filling—so scrumptiously good it would’ve been an authorial crime to let Gwen traipse into the city and not share a piece with someone she rather likes. (It’s so romantic on the borderline…) Check out this recipe if you don’t believe me! Any updates to the travel stops or new sites where there are interviews or giveaways can be found on my website--I hope you'll join me for a few other cities on the tour!! And if you'd like to read an excerpt from A Summer in Europe, which is a Literary Guild, BOMC2 and Rhapsody Book Club featured alternate selection for December 2011, you can find one here. Have any of you ever visited Austria? Ever seen a film with Ethan Hawke and Julie Delpy called “Before Sunrise,” which was filmed in Vienna? Many thanks to Julie and to all of you for the visit! Julie, thank you!! It's a treat to be here and, wow -- a huge honor to have the "Julie's Mom's Stamp of Approval" -- I'm so thrilled she liked the book! Please give her my thanks and best wishes. And a big hug to you, too, in thanks for being so kind. I'm so glad we got to meet in person in Portland :). Oh, I love this post! The novel sounds amazing--going on my next book order. I've been to Austria (and many of the other destinations mentioned) and loved the Before Sunrise movie (and sequel Before Sunset). Wish I could go on the book tour! Best of luck! Another place on my list to visit! And that cake looks lovely, too. I had to look up the link to Billy Joel's song. My husband is sleeping across the hall, so I'll have to wait until tomorrow morning to look up the song on You Tube. I'm writing myself a note! Joan, thank you so much -- I really hope you'll enjoy the book! Glad to know I'm not the only one who loves Before Sunrise and Before Sunset. They were both such well made films -- humorous and touching by turns, introspective and searching... I've watched them both so many times, I could almost walk through Vienna and Paris with them and parrot their lines, LOL. And I wish I could go on the book tour for real, too (!! ), although I'm enjoying my virtural one quite a bit ;). A wedding ... oh, and some book news!